From left: Latu Tuitani (ATS), Tourism Fiji chief executive officer Matthew Stoeckel and Manasa Malani (AFL) at the Sofitel Fiji Resort and Spa on Denarau last night. 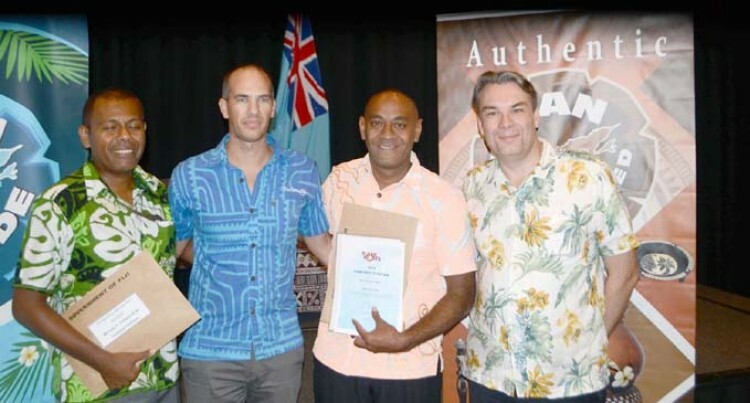 Tourism Fiji chief executive Matthew Stoeckel last night honoured a Nakorotubu native who walked away with the Fijian Host award for the year 2016 at the Sofitel Fiji Resort at Denarau. “The warmest hospitality and the highest level of service is needed and this is where Fijian Host fits in,” said Mr Stoeckel. Fijian Host is an initiative where the frontliners at the Nadi International Airport get recognised for their customer service after nominations by the international visitors. The visitors provide feedback on the frontliners through a response card which the tourists fill in. 37-year-old Mr Malani said the annual award was the result of the motivation he received after winning a triple monthly award for July, September and October. “This really motivated me and my colleagues as part of increasing my skills in customer service,” he said. “I come to work and try to be always happy with my performance in the full eight hours; not just the first three hours. “There is a need to perform with consistency and hard work gets recognised this way. He joined Airports Fiji Limited in April 2015 and is currently a public relations officer. He is currently pursuing a bachelor’s degree in commerce and hotel management but interestingly started as a law student. “In tourism you meet happy people, people coming to Fiji makes you really happy. It feels good to work in compared to being in law,” he said. His hobbies include socialsing with people, helping with charitable organisations, reading, and of course sports like rugby and volleyball. Mr Stoeckel said that 2017 was looking very positive for Fiji. “We are expecting a further increase in our visitors’ arrivals as we expand our marketing activities in our traditional and emerging markets,” he said. He shared the importance of improving service required constant improvement. “This is not achieved in one day and needs constant improvement,” he said. He thanked the sponsors involved in the Fijian Host including Fiji Airways, Sofitel Fiji Resort and Spa, Warwick Fiji Resort and Spa, Plantation Island Resort, Captain Cook Cruises, Gateway Fiji Hotel, Shangri-La’s Fijian Resort and Spa, South Sea Cruises, Tanoa International Hotel and Tourism Fiji.